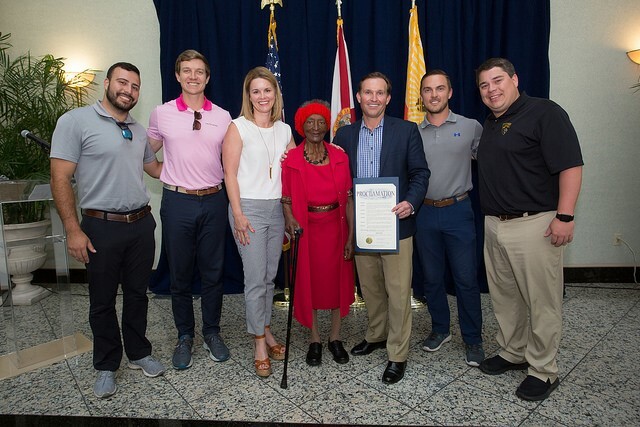 Jacksonville, Florida – On May 7th Jacksonville, FL Mayor Lenny Curry signed a Proclamation recognizing S.A.F.E. team member Katie Davis for her decades of service to the Jacksonville community. In her role with S.A.F.E. as the VIP Elevator Operator at the Jacksonville Veterans Memorial Arena, Katie interacts with many venue guests, including Mayor Curry. Her commitment to guest services caught the Mayor’s attention, leading to this recognition. The Mayor surprised Katie with the Proclamation during a ceremony held in the Jacksonville City Hall Atrium. Katie is a prime example of the type of team member that upholds S.A.F.E.’s philosophy and ensures exceptional guest service at every event!